Pump rental provider, Selwood, supports global mission for safe water. Selwood, the UK’s leading supplier of pump rental solutions, played its part in helping to provide clean water and sanitation to some of the poorest people in the world. The company supported a charity event at Chepstow Racecourse that was organised by Welsh Water, a long-standing customer of Selwood. Selwood donated £1,000 to the event – bringing the total raised for WaterAid to more than £12,220. WaterAid, founded in 1981 by the UK Water Industry, is a non-governmental organisation focused on improving access to safe water, sanitation and improved hygiene. 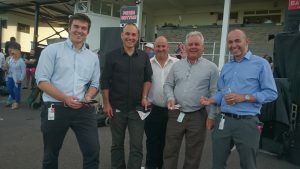 The money raised from the charity race night will be enough to pay for two composting latrines or five gravity-flow water schemes to provide safe water for 1,500 people in Uganda. Dave Allison, regional account manager at Selwood’s branch in Bridgend, attended the charity event, which included a dinner, raffles and auction of prizes, including VIP seats at Everton and Old Trafford. More than 130 guests from partners within the water industry attended the event. Dave said: “Welsh Water is a long-standing customer of Selwood that we work with on a daily basis from our local branch, so we were delighted to offer our support. “It was a great event for a really worthwhile cause which Selwood has been supporting for several years. “Every day we drink clean water without really appreciating how lucky we are. Selwood has been a major supporter of WaterAid, with director Richard Brown flying 5,000 miles to Madagascar last year to see first-hand how communities can be blighted by poor sanitation. The visit was part of a campaign headed by Wessex Water and its partners. There, Richard and his fellow team members helped dig canals, carry water and sand and build sanitation facilities. They also met many of the local villagers who are being directly and positively impacted by these fantastic initiatives. More than £2,300 was raised by Richard and his supporters to help bring a sustainable clean water supply, sanitation and hygiene education to the region.